• Woodlands are dry and open mixed forest ecosystems that occur on rocky outcrops where there are quickly drained, shallow, nutrient-poor soils. 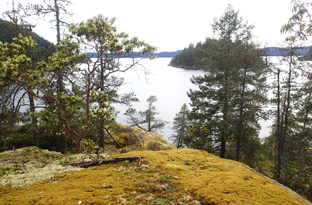 • The open canopy of woodland ecosystems allows for a diverse understorey of wildflowers, grasses, shrubs and mosses; as well as specialized habitat for insects, reptiles and birds—including identified at-risk species. • Woodlands are commonly interspersed with rocky and herbaceous sensitive ecosystems and together they form resilient and species-rich mosaics throughout the Discovery Islands. DIEM has mapped Woodland Ecosystems Orange in the Sensitive Ecosystems Mapping. 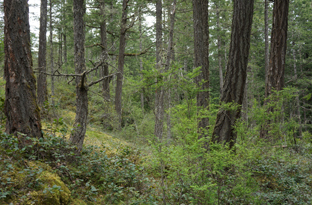 Along the coast, woodlands are often a mix of coniferous and deciduous trees, such as shore pine, Douglas-fir, Sitka mountain ash, and alder. 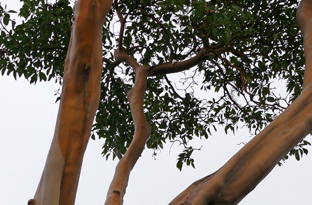 Another species typically on south-facing slopes is arbutus, or Pacific madrone. Arbutus are Canada’s only native broad-leafed evergreen tree and the Discovery Islands are the northern end of their range. 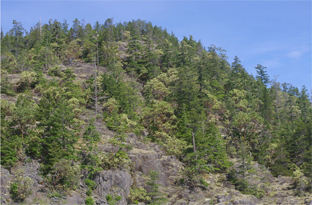 Inland and high elevation woodlands are mainly open coniferous forests. Many woodland sites that are not easily accessible remain intact and undisturbed. 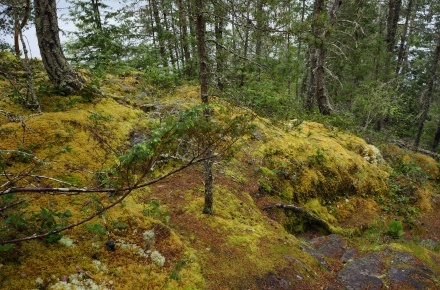 Woodland ecosystems may contain small moist areas where water collects to form seasonal ephemeral pools that support rich vegetation. Mixed age-classes of trees, a relatively open canopy, established understorey communities, snags, and the proximity to other ecosystems contribute to the high biodiversity and resilience of woodland ecosystems. Ecologists hypothesize that woodland ecosystems are likely to survive as climate changes, due to their ability to exist in dry conditions. However, woodlands are also highly vulnerable to natural and human disturbance, including soil damage, erosion, fragmentation, pests and invasive species. As our climate transitions, protecting healthy woodlands may prove valuable, and essential to the survival of many species. WHEN YOU EXPLORE take special care in the summer when woodlands become tinder dry: a slight spark will easily ignite parched moss or dead wood and quickly create a fast-spreading wildfire. TYPICAL FAUNA Band-tailed pigeon, black-tailed deer, common nighthawk, common woodnymph, cougar, garter snake species, northern saw-whet owl orange-crowned warbler, solitary vireo, sooty grouse, spotted towhee, Swainson’s thrush, western pine elfin butterfly, western screech-owl, yellow-rumped warbler, songbird species. TYPICAL FLORA Arbutus, Douglas-fir, ocean spray, pipsissewa, red-stemmed feather moss, other mosses and lichen, baldhip rose, common juniper, common red paintbrush, common snowberry, hairy manazanita, salal, shore pine, Sitka mountain-ash, western trumpet honeksuckle. 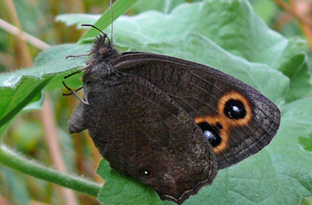 The common woodnymph is a large brownish-grey butterfly with two large distinctive eyespots on the forewings. The female lays eggs probably on broad-leaved grasses and the butterflies nectar on a wide range of flowers available in July and August. 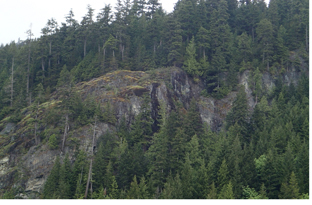 The diminishing undisturbed native grassland, open forest areas have made this butterfly red listed in BC. The sooty grouse can be surprisingly tame. 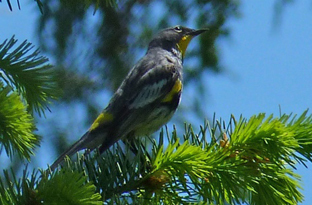 The male is usually encountered when courting in spring and making a series of deep hooting calls. 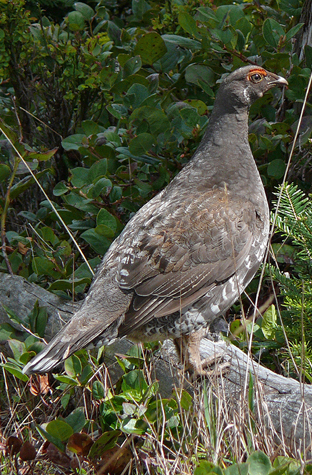 These grouse eat various insects and plants – leaves, buds and berries. They favour the openings and edges in older forests. While northern flickers frequents any habitat with trees, they are usually found in more open forests where nesting is in tree cavities. 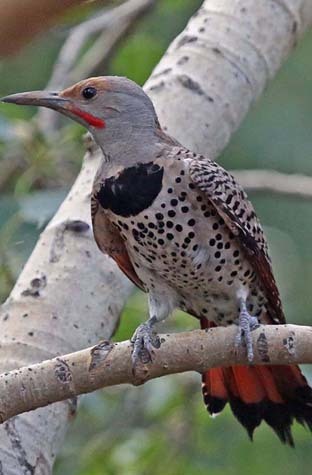 Flickers feed on ants and other insects, as well fruit and seeds, often foraging on the ground. Their looping flight and call – “clear” are distinctive. Western pine elfin is blue-listed in BC. 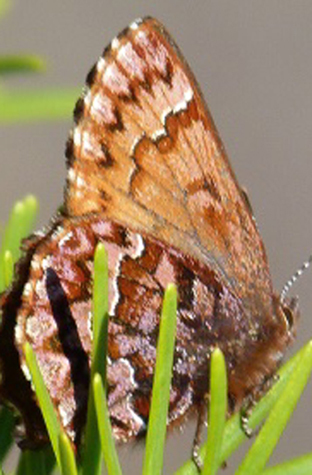 The is an attractive, early-season butterfly, nectaring on available flowers and willow and laying eggs on the needles of shore pine, where the caterpillars will feed. Western pine elfin is blue-listed in BC. 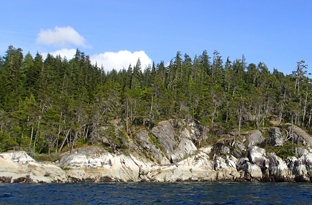 The arbutus is at the upper-limit of its northern range in the Discovery Islands. This evergreen-leaved tree with its reddish, peeling bark, white, spring flowers and red fall berries is both a distinctive handsome tree, as well as a valuable berry supply for birds. Arbutus grows in similar dry, sunny rocky sites and bears some resemblance to much smaller hairy manzanita shrub. Ocean spray’s tough ‘ironwood’ stems were used for items like digging sticks, bows, harpoon shafts, and pegs (before nails). The stems grow in erect, arching shapes, often over 2m. 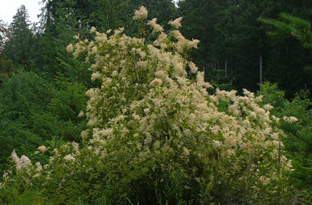 They have small toothed leaves and abundant clusters of creamy white flowers in May or early June. The seeds are a favourite for small birds like chestnut-backed chickadees. 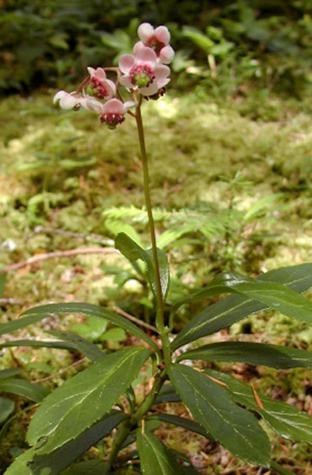 Pipsissewa or prince’s pine has distinctive whorled oblong, toothed, leaves and a cluster of attractive waxy pink flowers atop a short stalk. 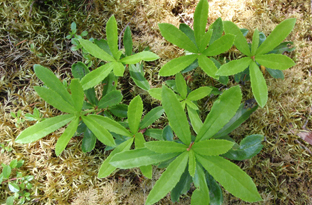 It grows in both open and dense coniferous forest sites and this evergreen, woody shrub-like plant is often found in mossy sites near organic debris.